David Copperfield was the first book Sigmund Freud gave his fiancee, Martha Bernays, on their engagement in 1882. It was the gift of a lifelong Anglophile to his beloved, a book encrypted with peculiar meaning to a man with a special fascination for the complicated relation of autobiography to storytelling. Freud's choice – and Dickens's own opinion that David Copperfield was "of all my books" the one he liked "the best" – helps clarify an impossible selection midway through the 19th century. At the outset, I'm going to anticipate your howls of rage. Some Dickens aficionados will be dismayed. Why not Pickwick Papers? Or, better still, Great Expectations? Or Bleak House? Or Little Dorrit? And why not, here in the holiday season, that festive evergreen A Christmas Carol? Or the granite brilliance of Hard Times? Yes, in different ways, all masterpieces. Everyone has their favourite. This is mine. I love David Copperfield because it is, in some ways, so un-Dickensian. The story – so appealing to Freud – is of a boy making his way in the world, and finding himself as a man and as a writer. In the first half, before Dickens's irrepressible storytelling kicks in and the motor of the novel starts to hum with incident, we find him almost meditating on his literary beginnings. Dickens is one of the first to acknowledge the inspiration of the emerging English canon: Robinson Crusoe, The Adventures of Roderick Random and Tom Jones, the books he finds in his father's library. His own early novels (Oliver Twist, Nicholas Nickleby and so on) are largely comic picaresques. But here, he focuses on the interior life of his hero, as if saving the plot for later. 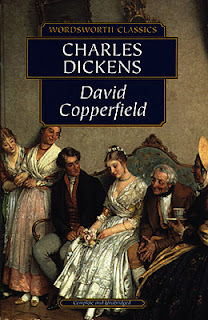 The second half of David Copperfield displays Dickens at his magnificent, and often uneven, best. There are the characteristic prose arpeggios, the virtuoso similes and metaphors, and the parade of timeless characters: Mr Micawber, Mrs Gummidge, Betsey Trotwood, Barkis, Uriah Heep, Steerforth, Mr Spenlow (of Spenlow and Jorkins) and Miss Mowcher. At the same time, Copperfield and Dickens, autobiographer and novelist, become so indistinguishable, the one from the other, that the novelist no longer has the necessary detachment from his material. When the lovely, tranquil reflections on boyhood of the opening pages become replaced by the urgent demands of plot-making, protagonist and author morph together in ways that are not completely successful, though always revealing. As the novel builds to a climax, in which Heep is imprisoned and Mr Micawber, free of his debts, finds redemption as a colonial magistrate in Australia, Dickens succumbs to the pressure to please a hungry public with a satisfying fictional feast. Henceforth in his work, Dickens will become the supreme Victorian entertainer and moralist, the author of those mature, and darker, masterpieces, Bleak House, Hard Times and Great Expectations. And so, as a key transitional text, David Copperfield becomes the antechamber to his subsequent mastery. But the door into the past is shut for ever; he can never go back. The young man daydreaming about literature among his father's old books has been replaced by the bestselling writer, "the Inimitable". Perhaps this was the poignant truth about creativity that so moved Freud. The novel that Dickens described as his "favourite child" went through many titles, from Only Once A Year and Mag's Diversions to The Copperfield Survey, The Copperfield Confessions and The Last Will and Testament of David Copperfield. Eventually, with serial publication looming, he settled on The Personal History, Adventures, Experience and Observation of David Copperfield the Younger of Blunderstone Rookery (Which He Never Meant to be Published On Any Account). It is hard definitively to identify the true first edition. Following serial publication from May 1849 to November 1850 – in 19 monthly one-shilling instalments, each containing 32 pages of text and two illustrations by Hablot Knight Browne ("Phiz") – the novel, now simply inscribed David Copperfield on the title page, was published in a single volume of 624 pages on 14 November 1850 by Bradbury & Evans of Bouverie Street. In any event, Dickens's MS, which is now in the V&A, had already undergone significant revision in the transition from magazine to book form. Three further editions (1858, 1859 and 1867) saw additional changes. The most scholarly edition to date is probably the text edited by Nina Burgis (Oxford: Clarendon Press, 1981).